This delightful museum is a triumph. Yes, it will be a draw for lovers of art but it has such broad appeal for those who appreciate the open and wooded spaces of this corner of The Netherlands. But who were Kröller and Müller? In fact they were a she and evidently a woman before her time. Helene Kröller-Müller was born in 1869 and was one of the first European women to curate a significant art collection. She was born Helene Emma Laura Juliane Müller in Essen, Germany. Her family were wealthy industrialists (has anyone ever heard of a poor industrialist?). Helene married Dutch shipping and mining magnate Anton Kröller in 1888 thus becoming Mrs Kröller-Müller. But she was not destined to become a conventional housewife. 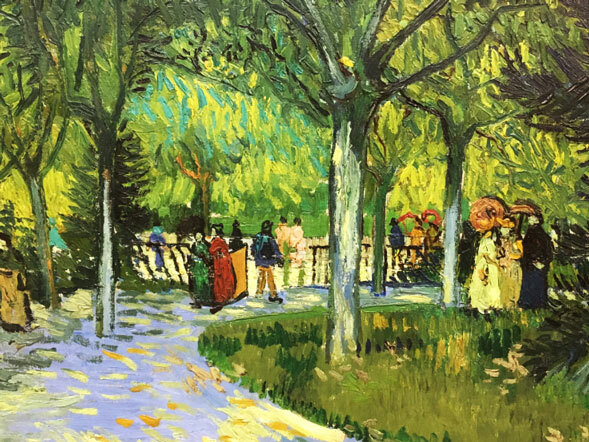 Helene studied under Henk Bremmer between 1906 and 1907 and then she began constructing her collection, and was one of the first people to appreciate the paintings of Vincent van Gogh. His work formed a large proportion of the collection with 90 paintings and 185 drawings. It is, in fact, one of the largest collections of van Gogh outside the bespoke Van Gogh Museum in Amsterdam. From 1913 parts of her collection were open to the public in an exhibition hall in The Hague. It was one of the few galleries where one could see works of modern art at that time. In 1928 Helene and her husband created the Kröller-Müller Foundation to assure the future of the increasing collection and of their estates. Between 1907 and 1922 they had acquired more than 11,000 pieces of art, making this one of the largest private collections of the twentieth century. In the mid-1930s, they donated their entire collection, totalling approximately 12,000 objects, to the people of The Netherlands. There was one condition and that was that a museum be built in the gardens of the estate. The Kröller-Müller Museum was opened in 1938. The Kröller-Müller Museum we see today is surrounded by 30 hectares of beautiful unspoiled wooded country estate, and is the largest national park in the Netherlands. A large forest sculpture garden was added in 1961 and includes works by Auguste Rodin and Henry Moore. The garden is open all year offering different perspectives of these sculptures as the quality of light and shade changes. Many people will come especially to see the works of Vincent van Gogh, and those pieces include Café Terrace at Night, Sorrowing Old Man and a version of The Potato Eaters; but there are other works by Piet Mondrian, Pablo Picasso, and many more. But I made a discovery! 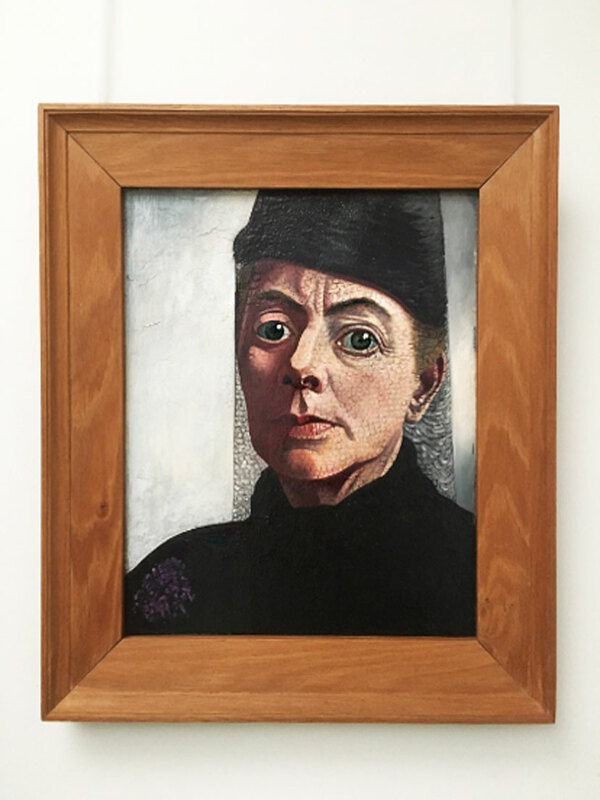 An artist called Charley Toorop. She became a member of the group of artists called Het Signaal (The Signal) in 1916. The group strove to depict reality through the use of colours and heavily accentuated lines and contrasts. I found three self-portraits by this lady and they displayed Het Signaal characteristics in striking fashion. We find a woman aging and showing the cares of passing years. It’s said that eyes are the windows on the soul and the eyes on this trio of canvases draw one in. These eyes are large, wide and are somehow ‘haunted’. There are the permanent exhibitions which will always be popular with visitors, but there are also temporary exhibitions which will encourage return visits. Arp: The Poetry of Forms starts on May 20th 2017 and continues till September 17th 2017. Jean (Hans) Arp (1886-1966) is considered to be one of the most innovative and influential artists of the European avant-garde movement. The exhibition offers sculptures, reliefs, sketches, poetry, and books. Between 1925 and 1927 he published several of his poems in the magazine De Stijl. Like those artists who were recently showcased with major solo exhibitions, Arp is being included in the artistic offerings of the Kröller-Müller. He was a great supporter of the museum and the director, Bram Hammacher, expanded the sculpture collection with one of Arp’s works. 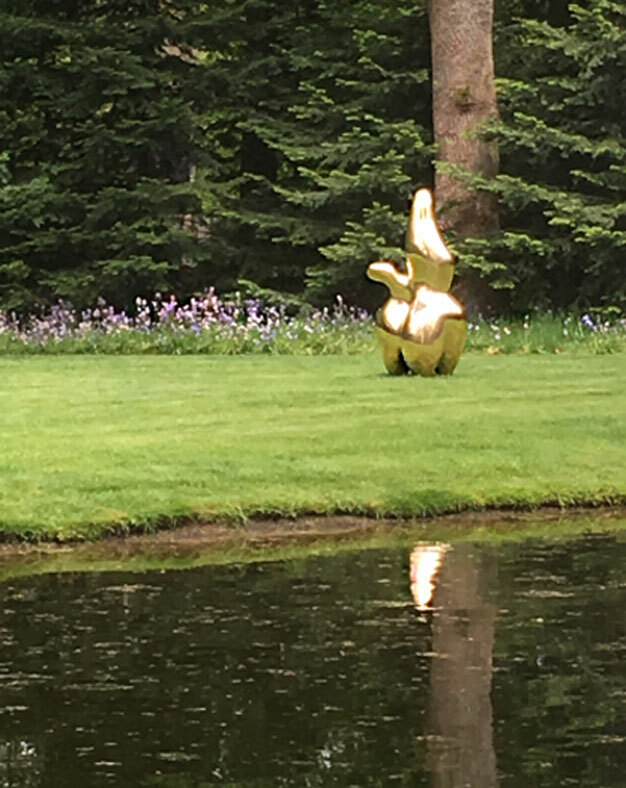 That piece is called Cloud Shepherd and it shines still in the garden, and is mirrored in the lake. This must surely be one of the most iconic permanent sculptures at The Kröller-Müller Museum. I am not an art professional and I find some museums to be dry and dusty halls of irrelevance. 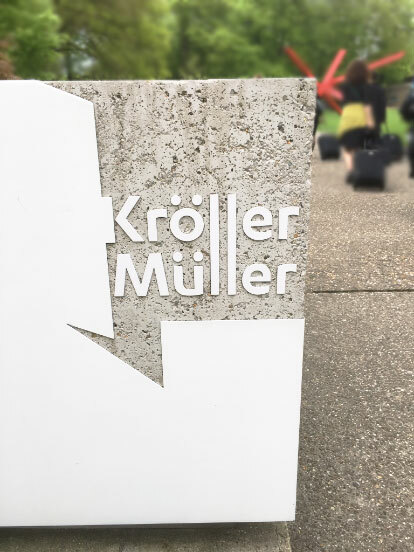 I was charmed and excited by The Kröller-Müller Museum, in which I could have lingered long. True, there are the works of the great Masters of painting and sculpture, and they are thrilling to see at close quarters, but there are the lesser-known gems which might actually encourage the viewer to ask more questions and to embark on their own journey of artistic discovery. Tuesday to Sunday 10.00 hrs to 17.00 hrs (the sculpture garden: 16.30 hrs). The museum is closed on Mondays (except national holidays: Easter, Ascension Day, Pentecost, Christmas, King’s Day 27 April, Liberation Day 5 May) and on 1 January. Walk, or cycle to the museum on one of the free white bicycles from the park entrance to the museum.